Their house was destroyed minutes later by torrential rains." Bear sponsorships are available for $10 per bear. Sponsorships allow you to send a bear to Africa even if you don't knit and are a wonderful way to honor a friend or loved one. The bear's tag will carry the name of your choice. In addition, Mother Bear Project will send an acknowledgement to you or your honored recipient to let them know a bear has been sent in their name. Please enter $10.00 on the PayPal page for each bear sponsorship ordered. After completing the PayPal transaction, please email Mother Bear Project and let us know that you have ordered a sponsorship. Include information on who you would like to honor, the occasion, and mailing address. 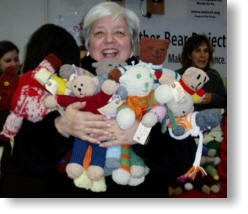 This Mother Bear Project Volunteer sponsored a bear for each member of her book club as a holiday gift. Include information on who you would like to honor, the occasion, and mailing address.